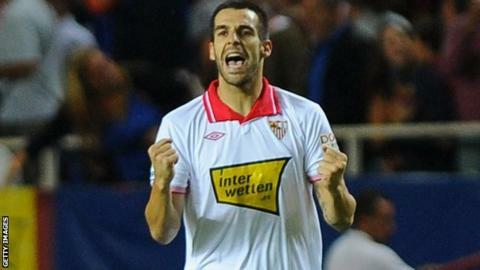 Manchester City have completed the signing of Spain international Alvaro Negredo for £20m from Sevilla. The striker, 27, arrived in Manchester on Thursday to undergo a medical before finalising the deal. He joins former Sevilla team-mate Jesus Navas in new manager Manuel Pellegrini's reshaped squad, and will wear the number nine shirt. Fiorentina's £28m-rated attacker Stevan Jovetic, 23, should be City's next summer purchase. Montenegro international Jovetic has previously attracted interest from Arsenal, Manchester United and Everton but will have a medical at City on Friday. Negredo is the first incoming deal completed since Pellegrini officially took the reins as City manager, with the signings of Navas and Fernandinho taking place in the days before the Chilean's appointment. The Spaniard has won 14 international caps, scoring six goals, and was part of Spain's victorious Euro 2012 squad. At a farewell press conference in Seville on Wednesday the former Real Madrid player said he was looking forward to the next stage of his career. "For four years I have been very happy, but I think my time was over here," the forward, who scored 26 La Liga goals last season, said. Ex-Sevilla winger Navas, 27, sealed a £14.9m transfer on a four-year deal earlier this summer and Negredo said: "I am happy to be spending another year with him." Sevilla president Jose Maria del Nido said: "Manchester City are buying a great player, the top-scoring Spaniard in La Liga. "This is a big deal for Sevilla, the second most important in our history after we sold [now-Barcelona full-back] Daniel Alves, and the player will sign the contract of his life. "Everyone should be happy - it is a great deal for all three parties." Sevilla, who have faced financial difficulties, have also sold playmaker Luis Alberto to Liverpool,full-back Antonio Luna to Aston Villa, and midfielder Jose Campana to Crystal Palace.